OmniFocus is the best Todo App out there and I love it. I’ve been lucky enough to buy the legacy ios app at 20$ but I’m always scared that they stop updating the app and that I would have no other choice than to upgrade to the universal app. Right now, the upgrade bundle is at 35$ (cad currency) and even then, I would have to pay another 28$ to get back the pro add-on (that is active on the legacy app). That make an upgrade price at 63$ wich is more than three times what I paid for the actual app and since I don’t have an ipad/iphone6/watch… I have no new feature. You may say don’t updgrade… but time will come when the legacy app will not be supported and even tho I love OmniFocus, it’s still the first time it would cost me 3x more to upgrade than the actual app cost me at the time. You get OmniFocus. Life is simple again! You are now an OmniUser. You like OmniFocus so much that before long, you also add your personnal tasks along your proffessional but there it is… how to separated both… well… you can’t! You need the Pro add-on to get the ability to “Focus” (in a app that’s called OmniFocus) and get those custom perspective. Keep in mind that in that price, you had to pay in total 83$ for the Pro Add-on just to be able to “filter” thru your projects and sort between your personnal and professional life. Scripting is an advanced feature so I understand the extra but Custom Perspective and Focus?!? I’m I not already buying OmniFocus for the sole purpose of clearing things in my life? Not doubt OmniFocus is one of the best (if not THE best) todo app out there. But you I’m sure OmniGroup is loosing customers with those price tags. I would have never paid 83$ for an ios App. The past price tag of 20$ was just fine for my uses. Am I alone with that feeling? Possible new user - do I spend or do I wait? I paid a total of US$69.98 (= Cad$91.08) for the Pro versions of both apps, iOS and Mac OS X. Since, IMHO, OF is far and away the best suite of its kind (I’ve tried 'em all! ), I’m very happy. I rely on it almost hourly and it’s lived up to all my expectations of it. I have the pro versions of the apps. It paid for itself in increased production in 2 months. I’m fine with paying the relatively high prices for the apps from The Omni Group when I see how much work they put into them and know how seldom there are paid upgrades. I had a listing across town that I needed to visit. It was about 30 minutes away. I needed to pull the lockbox and the sign as it had just closed escrow. Earlier in the week I had set a lunch appointment that was relatively close to the house. Had I utilized OmniFocus, I would have set a context for both tasks geographically, and would have knocked them both out at the same time. Instead, I forgot I needed to hit the house while I was at the lunch meeting and had to spend another hour driving out the next day. My time is worth way more than the cost of this app. Value for money = satisfaction minus price. For me it is worth it. If memory serves me right, it was about 6 years between paid upgrade cycles from version 1 to version 2. I didn’t have to pay a yearly upgrade fee to keep up. So I think that the entire OmniFocus suite plus upgrade package is definitely worth it. The suite has truly evolved over the years. 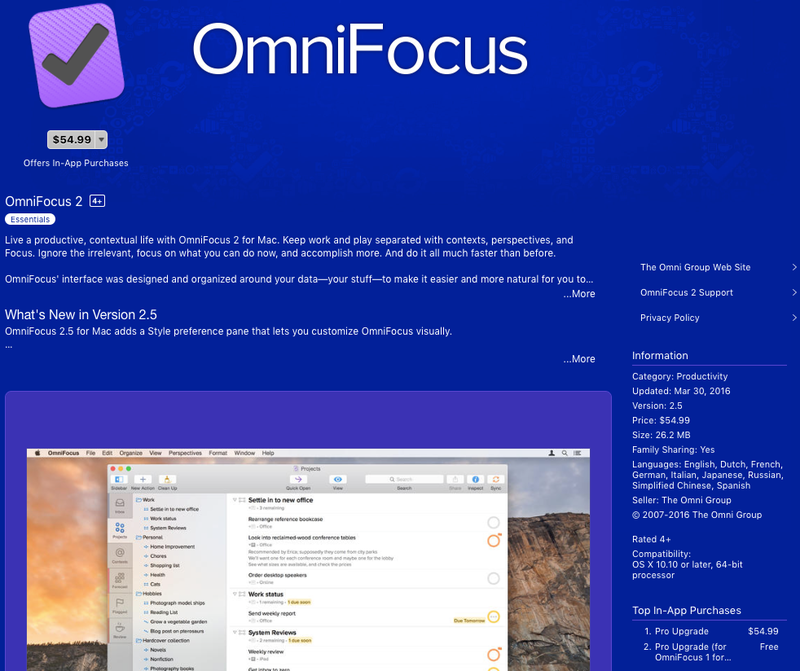 OmniFocus is one of the first apps to be installed on all my iOS devices and Macs. and you get a stable Omnicloud-solution for sync and and so on, without a yearly subscription. I’ve bought v1 a long time ago and v2 (universal and the iPhone) some years ago and it’s not more then 2 stops on the gas-station with a car. Right now, the upgrade bundle is at 35$ (cad currency) and even then, I would have to pay another 28$ to get back the pro add-on (that is active on the legacy app). If you have Pro features (custom perspectives) unlocked in the legacy iPhone app, you’ll keep those same features when you upgrade to the universal app—there’s no need to purchase Pro just to get back to what you already had. At the risk of being simplistic… could this remind of us the proverb about the person looking in a lighted street for the lost key to their house actually dropped in some leaves right outside their front door, which happens to be on a still unlighted street. “Why don’t you come and look in our street?”, says a neighbour. IOW you get what you pay for! Quite humbling all those replies!!! Also thanks to @kcase to take the time for that reply… I didn’t know about the pro feature. So there it is :) OmniFocus worth every penny without a doubt! I’d be surprised if any of those of us who’ve replied didn’t appreciate - at least, didn’t understand - your reluctance to spend a sum like that which you’ve shown would be necessary. Being an oldie from the days of WordPerfect, Lotus and dbase (Now those prices were steep! $400-$500 & up) I find today’s software is almost a giveaway. I think that Omnifocus is an expensive software suite. However, as a web application developer, I also understand why. End user expectations and the complexity of these products have increased dramatically. Quality applications, both web and desktop are difficult and expensive to maintain. I’d be retired right now if I had a penny for every time a PM asked me for quick and easy change and what they were really ask for was a fundamental change to the underlying data architecture. A lot of software is moving to the subscription model because the only way to maintain profitability while meeting the demands of the end user is to do so. Instead of monolithic updates from 1.0 to 2.0 to 3.0, it allows for constant incremental iteration and improvement that customers demand, while allowing the company to continue actually making money. The alternative is to charge a lot for complex software. That being said, I aways recommend people thoroughly test out a piece of software to make sure it fits into their workflow before purchasing it. For me, time is money and so if a piece of software is $1000, but saved me $5000 over it’s lifetime, I’m completely okay with that. That’s why from that perspective I don’t find Omnifocus to be expensive. It’s more expensive than a lot of task managers, but it contains essential functionality that I personally need that others may not. It is program I recommend to a specific subset of people, but for many it is not the right fit and I think that’s okay too. Short answer here, but I’ve found it to be an invaluable addition to my workflow. Problems do exist (See below), but overall, I’ve found it to be a net-gain and sufficiently so that I’m willing to pay for the product across its two product lines (macOS, and iOS) and for its upgrades. I think, OmniGroup ran its calculations on the price tag… Remember, OF appeals to a very specific group of customers, who are willing to pay for an increase in personal productivity. People, who don’t bother with such questions, wouldn’t pay even a lower price. After maybe 7 years of plain text task management with TaskPaper, I tried OmniFocus for a week in January of this year, as an alternative to updating lots of Applescripts etc. for TaskPaper 3. I very quickly bought Pro license on OS X and iOS, and after three months of use I’d say it’s well worth every penny spent for the improvements in my workflow & task and time management. It’s expensive, but worth it because you only pay once.